Thanks for hosting me today, Nicki. Winter Duet, which will be released from DSP Publications on 27th December, is book 2 of my WWII Echoes Rising series. Although I’ve written the books so they can be read without having read the previous books, the story continues events from the first book in the series Shadowboxing. The third and final book Comes a Horseman will be published by DSP Publications in August/September 2017. When I first got the idea for this story I knew it would either be a series or one very long book. I decided a series would be easier to write/read, especially as the story easily lends itself to be split into three parts. 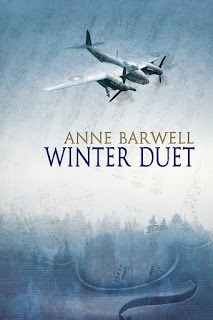 While Shadowboxing took place in Berlin in 1943, Winter Duet picks up the action a couple of months later, as the characters travel across Germany toward Switzerland. With this release being the 2nd edition of the book, I was writing the next one in the series while I was editing this one. I had to keep both books in my mind while remembering not to reference something that hadn’t happened yet. However, on the flip side, it made continuity for Comes a Horseman much easier. Usually I have a little more writing distance between books so I’m continuously flipping through the previous one in a series to check details so it all meshes together. Kristopher dropped to his knees and examined the boy. His eyes were glazed over, and he flinched when Kristopher touched him. “He must have hit his head when he fell,” Kristopher said. He brought his hand away from the boy’s temple. It was covered in blood. “He needs help. I can’t do much for him here, apart from just try and stop the bleeding.” He quickly opened his satchel and pulled out a short length of bandage, bundled it into a wad, and held it against the wound. Although it probably wouldn’t be enough to stop it, it was better than doing nothing. Head wounds tended to bleed, didn’t they? It didn’t mean it was something serious, but it could be. He let out a quick breath. Damn it. He wished he’d paid more attention when he’d watched Clara at work. Why had he agreed to disguise himself as a medic? In this situation when that was exactly what was needed, he was next to useless. “Fritz,” the boy replied, his voice wavering. He put his arms around Michel’s neck and clung to him. Thankfully, he seemed more alert than he had a few moments before. “You promise?” Fritz’s earlier confidence was gone. “I didn’t think it was so dark. I know this place. I shouldn’t have tripped.” He glared at the ground. “Stupid thing. Stupid, stupid. Everything looks different.” He sniffled loudly and wiped one dirty hand over his face. “Do you remember the way to the shelter, Fritz?” Kristopher asked. Michel was watching Fritz carefully, holding the boy close to him. His grip had tightened at the first sign of Fritz’s distress. They’d never reach the shelter in time before it closed. “Michel’s very good at working together,” Kristopher told Fritz. He shone the flashlight around. The farther out into the street they got, the more rubble there was. It wasn’t safe to move too quickly, and at this speed they’d never reach the shelter before daylight. He glanced up at the sky. Most of the flashes of light now seemed to be focused toward the city center. Moments later, more rubble hit the street where they’d just been standing. If they’d stayed there, they would have been buried in it. “Yes, we’ll stay and help,” Michel said before Kristopher could say anything. He squeezed Fritz’s hand. “We’ll also help you find your mother, or at least someone who can look after you.” He looked over at Kristopher and gave him a questioning look.